Topics: Epdm Roof Systems, Modified Bitumen Roof Systems, and White Membrane Roof Systems. 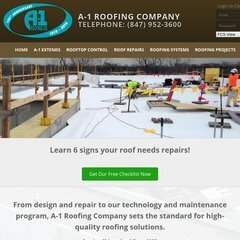 a1roofing.com Chicago Area Built-Up Roof System Contractors - Gravel Roof ..
ns32.domaincontrol.com, and ns31.domaincontrol.com are its DNS Nameservers. Its IP Number is 72.167.2.1. It is hosted by Godaddy.com Inc (Arizona, Scottsdale,) using Apache web server.